Geometry classes, Problem 158. Relation between the Circumradius, Inradius and Exradii of a triangle. Math teacher Master Degree. 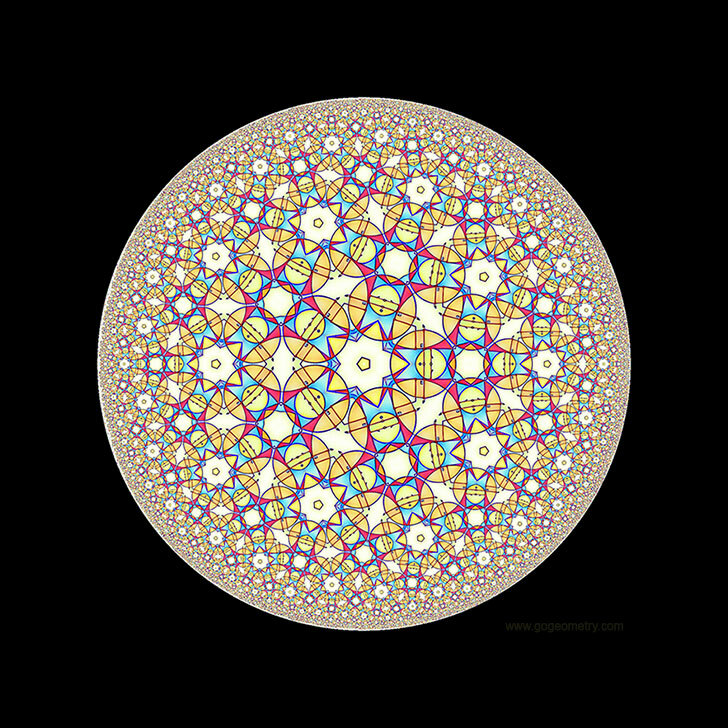 Geometric Art: Hyperbolic Kaleidoscope . College, SAT Prep. Elearning, Online math tutor, LMS. In the figure below, ABC is a triangle inscribed in a circle of center O (circumcenter), I is the incenter and E1, E2, E3 are the excenters relatives to the sides BC, AC, and AB respectively. Diameter DF of center O is perpendicular to AC at point E. If R, r, r1, r2, r3 are the circumradius, inradius and exradii respectively, (1) prove that , (2) prove that , and (3) prove that . Geometric Art: Hyperbolic Kaleidoscope of problem 158 using iPad Apps.